Yesterday I woke up needing a donut. It was one of those days. Operation 10 in 3 would have to forgive this moment of weakness. Donut selection is a tricky business. Do you really want to squander calories on some sweetly stale old grease-biscuit? No, you do not. What you need is help from someone who understands. Someone who can deliver the most delicious, the lightest, fluffiest, snowflake-sugared, utterly diet demolishing donut. And that someone is Paula Dean. I found her recipe for her French Quarter Beignets online and went for it. New Orleans is all over the news recalling the devastation of Katrina five years ago. Memories of my own 2002 New Orleans trip are hazy water color sights and smells at this point. Except for the food and music, which I can remember with pristine clarity. After eating THREE of my homemade beignets (insert your judgmental thoughts and scolding comments here. I certainly did!) I rolled over onto the couch to moan in low guttural tones, cursing Dean and her masochistically delicious treats. Add the confectioners’ sugar to a paper or plastic bag and set aside. 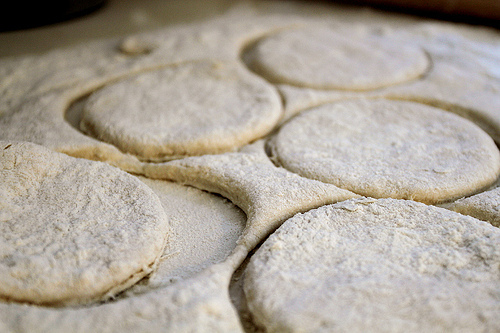 Roll the dough out to about 1/4-inch thickness and cut into 1-inch squares. Deep-fry, flipping constantly, until they become a golden color. 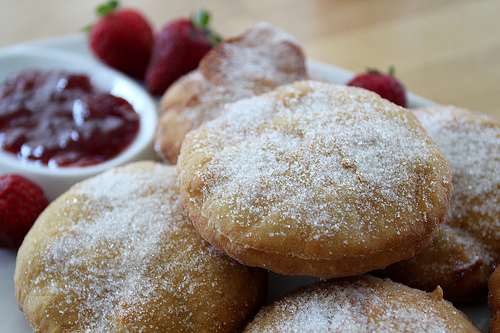 After beignets are fried, drain them for a few seconds on paper towels, and then toss them into the bag of confectioners’ sugar. Hold bag closed and shake to coat evenly. If they taste as good as they look, I would have eaten way more than three. I have a thing for cake donuts, but these look amazing! Nothing like Paula Dean to do you in. Yep! Her heart must pump simple sugar instead of blood! I don’t know what you mean by that but suddenly I feel guilty, and less cool! Haha! I’m just kidding! I just remember when you were telling us how you would eat ricotta and honey for dessert and we were like ‘daaaaaaang! she’s super healthy’! But I haven’t lost respect for you, if anything I have gained it! I love Paula Dean! So pleased to see the beignet pics! Trust you had some darkly rich and delicious Cafe du Monde style chicory coffee in which to dunk those delightful circles!